17th century hand knit silk italian jacket Victoria and Albert Museum. Note the basketwork pattern on the hem of the jacket. I want to be a Fearless Knitter, and for the most part I really am. (Yes, I read Knitting Daily.) My second knitting project ever was an Icelandic Lace Shawl. My third knitting project ever was fair isle color stranding work done on dpns. Both the hat and the mitts are much loved and get a lot of wear. The patterns for both the Rhinebeck hat and mitts are in The Book of Yarn by Clara Parkes. Appropriately enough, I got the yarn for the hat and mitts at the NYS Rhinebeck Sheep and Wool Festival last year. The yarn is Brooks Farm Four Play, a worsted weight wool silk blend. Positively wonderful to work with and feels great against the skin. It also keeps its shine and colors wash after wash. The colors offered at the festival were simply to die for and I had a hard time choosing. But I decided to use variegated colored yarn for the designs with an almost solid color as the background. I love the results. My very first knitting project was a lace and cable fitted sweater for my sister. I have to find the book to show you a picture. My sister has the sweater and wears it all the time. All this is just to say I am pretty fearless (or plain dumb) when it comes to knitting. The exception: the baby sweater. 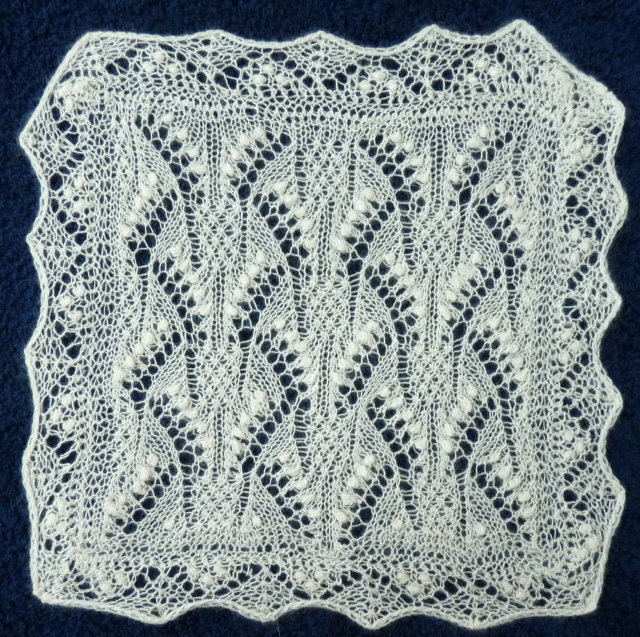 Yes, I did manage to come up with a nice diamond trellis pattern for the middle panel that I like a lot but the quivering and sniveling (along with coughing—still got that respiratory thing) and worrying that came before I decided on the panel pattern was uncharacteristic of me. Originally I am a quilter. Applique work is my specialty. In one class I was having a difficult time getting the fabric to follow the shape of a leaf. My teacher said to me, “Stop being afraid. You are bigger and stronger than that fabric. Fold it into shape.” And I did. I take that kind of attitude with knitting. If something I try doesn’t work out I can always shape it into something else. I have the control over the yarn, over the fabric that is ultimately created. It’s probably the only place in my life where I am in such control. Scary.